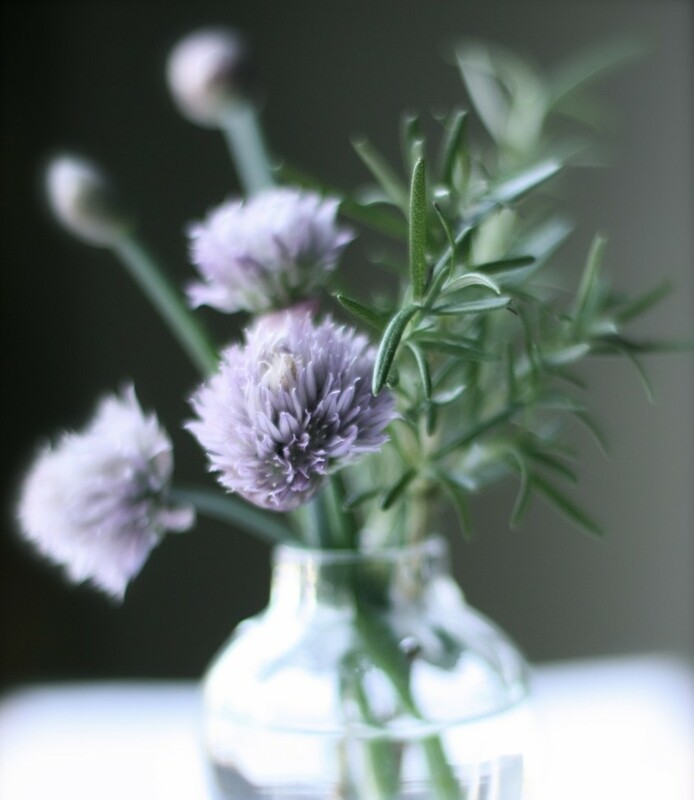 Chives are one of the easiest herbs to grow, and are a staple in my herb garden. They are hardy perennial plants from the same family as onions, leeks, and garlic. They grow in clumps with narrow, hollow leaves that reach about 6 to 12 inches in height. In the spring, they produce a mass of beautiful, globe-shaped violet blossoms which, I learned recently, are also edible. I planted a couple of small plants about three years ago, and, since then, I’ve been spoiled with an abundant supply of chives all year round. I love how much flavor fresh chive imparts to any dish. The blossoms have that same ability, adding a pleasant and mild onion flavor. Aside from being a unique garnish, chive blossoms make a nice addition to salads. When used to infuse vinegar, the vinegars that takes on the blossoms’s pretty purple hue. For these gougères, a savory variation of pâte à choux, I opted to use goat cheese instead of the traditional Gruyère. In addition, I mixed in both the leaves and the blossoms of the chives in the dough. The resulting puffs were light, with a slight crunch on the outside. They had an “eggier” and creamier texture on the inside than the traditional ones. I suspect it’s because goat cheese is creamier and has more water content than Gruyère. 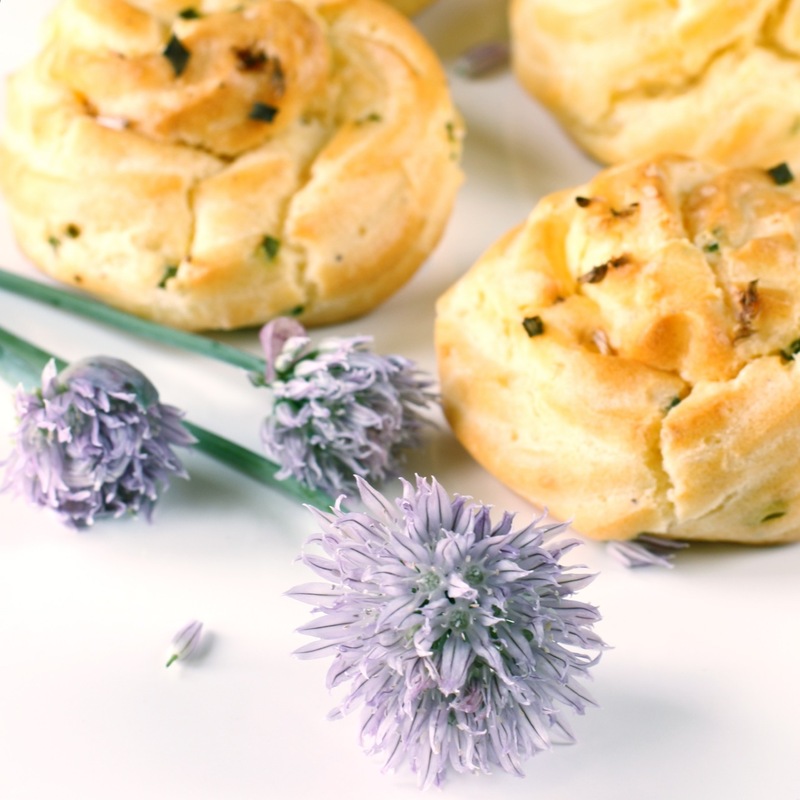 The mild onion flavor imparted by the chive blossoms is quite delightful and would go well with a smoked salmon or roast beef filling. After the gougères cooled completely, I froze half of them in a freezer bag. They’re nice to have on hand in case some unexpected guests drop by. Preheat oven to 375 degrees. Line two sheet pans with silicone mats or parchment paper. In a saucepan, bring water, butter, salt, pepper, and nutmeg to a boil over high heat. Reduce heat and add flour all at once. Cook, stirring continuously, until the flour is well incorporated and pulling away from the bottom and sides of the pan, about 2 to 3 minutes. Transfer to the bowl of a stand mixer fitted with the paddle attachment. Mix the dough for a minute or so, to cool slightly. Add the 4 eggs, one at a time, making sure each egg is fully incorporated after each addition. The pâte à choux dough should appear glossy and smooth. Add the goat cheese and most of the chives and mix well. Bake for 20-25 minutes, until golden brown and puffy. 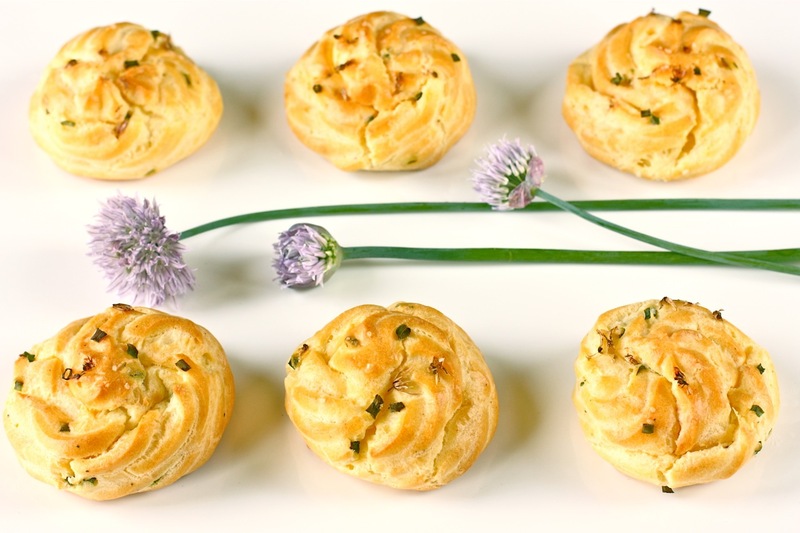 About halfway through the cooking time, sprinkle the tops of the gougères with the leftover chives. (This way the chives won’t burn on top.) Serve warm. Once cooled, the baked gougères may be frozen in a single layer in a freezer bag. Reheat them in a 400-degree oven for a few minutes. Adapted from Good Food Matters. Stunning pictures! Thanks for sharing!!! 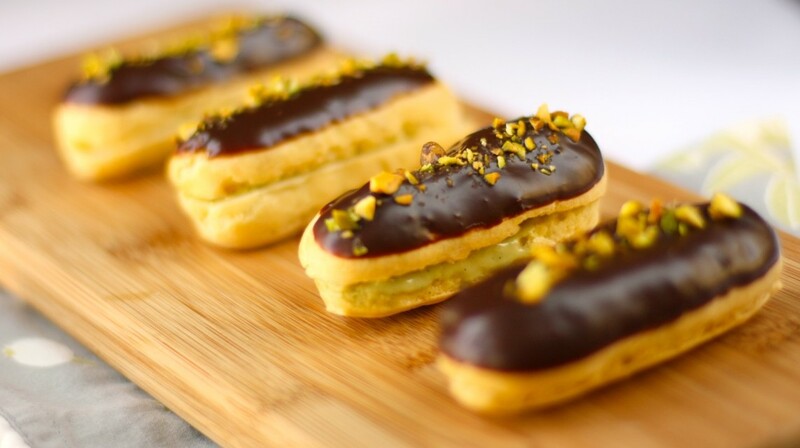 pâte à choux is something I have to try making, these look delicious! I have a chive patch in the garden to use too! Such lovely photos. And what a nice variation on gougères. I love how eggy they are and I discovered that the frozen ones are still good after reheating. What lovely photos. I must try making these one day, I’ll use your recipe when I do.. they turned out just perfect! Thank you! Let me know how they turn out when you do make them. Welcome and thanks for following Daisy’s World. I hope you enjoy reading it!